Sorry, but this post is not about relationships with indigenous peoples. It’s about shopping. Or one shop in particular, actually. One of the good things (as well as the bad!) of living in a small town, is that everybody knows you. Shopping, for example, is a totally different experience here than in the big city. No need to, completely embarrassed, having to put an item back in the super market just because you’re a few cents short of cash. Heck no, in Copán Ruinas I can probably go by a whole month without paying anywhere! I rather pay cash, but funnily enough, shop owners are all to keen to write up a tab. Up to a certain point. There is this one clothing store that each January puts up a huge list in the window with all the names (including surnames and nicknames) of the people who owe. With the amount of the debt, of course. 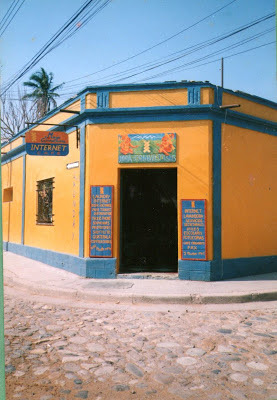 One of Copán’s main sources of entertainment for the local population. Shopping is a social event that goes well beyond the purchase of a product. More than money it’s gossip that goes over the counter and stores are a great place to run into people. That’s one of the reason I boycott the new supermarket in town. That and the fact that at Doña Berta’s I can just grab whatever I need and tell her I’ll pay tomorrow, without even the need to write it down! One store I’ve had a long personal relationship with is Maya Connections. 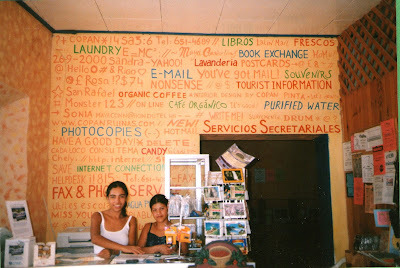 It is owned by my friend Sandra and opened, if I remember correctly, in 1997, as a small internet café in one of the rooms of her mother’s hotel, Los Gemelos. This was durin the years that I was lucky enough to have a huge and heavy laptop (with a black and white screen! ), but of course no modem or wifi. Not even a printer for that matter. So I used to write my emails at home or work, save it on something called a floppy disk (holding up to 1,4MB of information!!!) and bring that along to send off my emails at Maya Connections where four computers each had their own dial-up modem. No way of answering emails directly on line, that was way to expensive for 2,50 ($0,13) Lempiras per minute! Of course the connection was interrupted frequently, so I spend a lot of time at that store, munching on chocolates (imported from the big city and nowhere else available in Copán) or drinking a soda. Sometimes beer even, if connecting to the universe took too long. It was also the place in town for photocopies, office supplies, laminating and binding. Maya Connections even had a paper guillotine, one I used very often, although there was hardly a surface available to put the thing down. The already limited space of Maya Connections became even more cramped when Sandra decided to start selling souvenirs too. It was a little uncomfortable to sort hundreds of photocopies between bracelets, coffee mugs, teaspoons and car stickers, but business is business, and business was blooming. Even so that Sandra commissioned me and fellow painter Edgar Zelaya to paint a mural on the outside wall, one of the best we ever did in my opinion, but unfortunately painted over my Sandra’s mom when she moved out to a bigger venue. 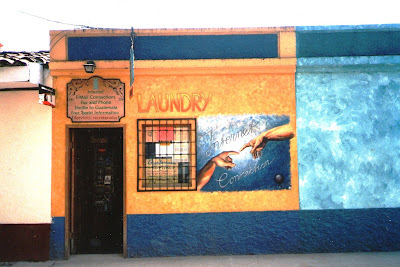 Because with a laundry service, the sale of shuttle tickets to Guatemala and a growing demand for computers, a much bigger space was required. So Maya Connections moved to a corner building a block south of the Central Park. Sandra asked me to do the interior design and gave me the free hand to “go nuts”, which I did. What a great time was that! A couple of years later, in 2010, Maya Connections had grown out of its seams yet again and besides, the property it was housed in was falling apart. So when the newly restored colonial building across the street became available, Maya Connections hopped over. Again I was asked to do the interior design, and this time we decided on a different look, sort of “recycled chic” with old pallets, wooden crates from the market and huge cable spools. 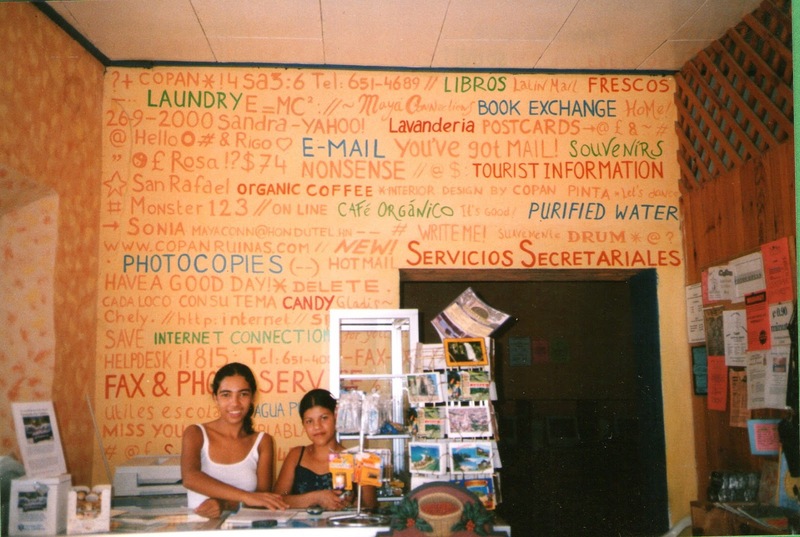 There was an internet café of course, but since more and more locals now had internet at home and travellers carried iPhones or smartphones, the main space was filled with souvenirs. And business was still booming. Booming so much that Sandra decided to expand in 2011 by renting the space behind the store as well, and turn it into an art gallery. Yet again it was my pleasure to decorate the place, this time using a Mexican folklore theme. We painted the outside of the building too, in the same colours as Frida Kahlo’s house in Coyoacán. Providing internet was by no longer a profitable business (the price had even lowered to 30 Lempiras an hour, making it five times cheaper than in 1997! ), so the focus was now on art and souvenirs. Alas, not every story has a happy ending, and this is one of them. This month, sixteen years after opening its doors, Maya Connections closed down. Business is too low, tourism has dropped substantially, competition has grown, so there is just no more space for Maya Connections. It’s a pity because, at least for me, Maya Connections has been part of Copán’s history. What I want to tell you is… I’m sorry, but this year I’m not going to wish you a Happy Mother’s Day. Thing is, it’s only the Friday before, and I’m already sick and tired of the whole thing. I could do without the noise pollution that seems to go hand-in-hand with commercial success, in this case the commerce in unnecessary and cheap products that for some reason people think are related with Mothers Day. I’m not very excited to see the stores fill up with the cheapest of the cheapest and mostly useless objects, primarily in the colour red and for that reason somehow related to Mother’s Day. I would be happier not to find a bunch of invitations to special Mother’s Day dinners at local restaurants in my inbox; and I’m seriously considering to boycott Facebook until Monday. I have nothing against Mother’s Day in itself. But I think that celebrating Mother’s Day once a year with a plastic rose, a cheap lunch package and a handmade gift by son or daughter (likely the same as last year) is just not enough. I don’t have kids and am very happy about it. It’s not that I don’t like kids, actually I do, a lot, I just don’t like them all the time!!! Not being a mother has been a conscious decision, one that I’ve never regretted. But that doesn’t mean I tremendously admire women who are mothers, especially the ones that have managed not to kill their offspring!!! Seriously, how do you do it??? I can barely manage a job and a household, so how to deal with a partner and a bunch of kids on top???? I find it truly amazing how women manage to deal with it all, especially the women in Honduras, who do not have the same resources and opportunities as women have in my home country. I’ve seen incredible women single-handedly raise a dozen or so while making the world go round. What I’m talking about here is women cultivating their own land, hauling water at the creek, grinding corn every day and still manage to send her kids to school. Amazing and admirable. So, no Happy Mother’s Day from me, this Sunday. But instead, I promise to honour, respect and admire you every single day for the rest of the year and the years to come. For every day you get up; for every night you go to bed exhausted; for every day you feed and educate your children; for every day you give them love, even though you’re not always loved the way back as you should be. For every day you worry and wish them well… I respect and honour you for doing what needs to be done, and doing it so well, even if you didn’t ask for it. Mothers of the world, but especially those from Honduras: you’re truly amazing. Always. 365 Days a year! I know, it’s a world wide problem. But as with a lot of things, in Honduras it seems to be worse. It might be a nuisance in other places, but here it’s epidemic. It’s everywhere. It haunts me. There is no escape. I’m talking about The Plastic Bag. -Any business shall hand out as many plastic bags to the customer as possible. Be stingy with anything, but with plastic bags. -The customer shall receive as many plastic bags as he or she can, and preferably ask for more. -If the purchased products are several, in stead of using one bag, try to put the different products in as many separate bags as possible. -Do not ever put cleaning materials (albeit already wrapped in plastic) in the same bag with edible products (often also packed in plastic) in the unlikely case the food might take on the smell of the cleaning products on the short trip home. -At the market, even if the customer brings her own shopping bag, put every single vegetable or fruit in a separate bag before depositing it in the shopping bag. -In case the customer needs immediate use of his/her purchase, the plastic back is immediately discarded outside the store. (And not in the garbage can, of course). -Since plastic bags are so common and so abundant, there is no reason for reuse whatsoever. -Plastic bags make great flying objects on the streets and therefore need not to be recycled. -Plastic bags also add a nice fragrance to home-burned garbage, yet another reason not to be recycled. Doña Berta, the owner of one of my favourite stores in the world (see a previous post on her store here) liked our policy too and it inspired her to have canvas shopping bags made for her regular customers. After all, as a shop owner, she’s sick and tired of having to pay for all those plastic bags! The Plastic Bag Situation is bad enough as it is, but it is even worse if they are imposed on you. Even without accepting any plastic bags, I admit I have hundreds of them, with no clear clue of how they got into my possession! 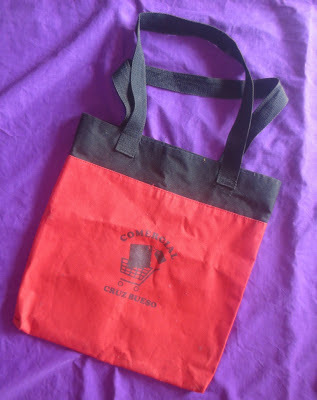 Really, there is no escape of the Plastic Bag… Not even here in the small town of Copán Ruinas, where everybody knows me. True, in a lot of stores the bag boy gets hissed at before he can trap my purchases: Stop! She doesn’t want a bag!!! But all too often I have to literally beg not to give me a bag. Nothing. So after I’ve paid and receiving several plastic bags, I start to unpack it all. That’s when the cashier finally wakes up from his or her preconditioned state of oblivion and looks at me like I’m the craziest person on earth. But I still don't want that plastic bag.